The Buyer: Mr. Craig Mahurin was a small business owner/operator and had years of management experience in the commercial banking and pharmacy benefits industries. Mr. Skip Jackson was also an experienced executive with sixteen years as a small business owner/operator of several manufacturing and distributing companies and eight years with a Big Four public accounting firm. 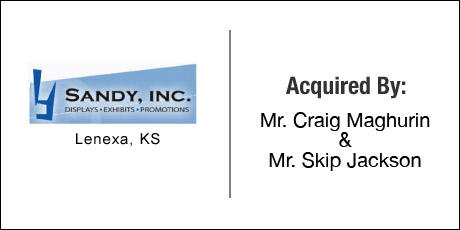 The Seller: Sandy, Inc. founded in 1952, designs and manufactures retail and POP displays and trade show exhibits. The company is located in a 33,000 square foot facility in Lenexa, Kansas. The company creates displays and exhibits, from concept to build, to match their client’s individual style and branding. Their focus is helping their customers differentiate themselves from their competitors. The Close: Sandy Inc. had just undergone a management buyout twenty-four months before the DVS Group had identified it as a target company for its buyer clients. The current manager/owner realized that he did not enjoy the role of owner and DVS was able to negotiate the deal, source the financing and close the transactions within forty-five days of signing the Letter of Intent.